Let me be clear right from the start: I am no Star Trek historian. In fact as of 2009 I couldn't even call myself a Star Trek fan on any level, as I had literally never seen a single thing from the universe that Gene Roddenberry created so many years ago. Nothing. Not a single episode of the show and not a single film. If it wasn't for a steady flow of positive word of mouth coming from those who had seen the 2009 J.J. Abrams reboot, I can't promise when I would have watched that one either but I gave it a shot, and I absolutely loved it. Still do. Same can be said for its sequel Star Trek Into Darkness, which falls a bit short of the first but plays right into my wheelhouse in terms of tone and entertainment value. 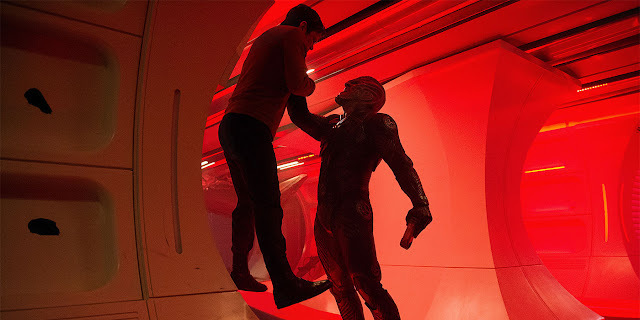 I prefaced my feelings about the two new films with my total lack of Trek knowledge because the main issue I have heard from many regarding the Abrams take on these stories (especially Into Darkness) is that it just doesn't feel like the Star Trek that many knew and loved growing up, and also the fact that apparently the second film is too much of a mirror image of previous work meant to whip up nostalgia rather than tell a compelling and original story. Whether Abrams captured the spirit of what true Star Trek should feel like, I do not know. Whether he apes the ground others had previously tread for him, I cannot possibly know since I have never walked that ground before, and even if he did it might be hypocritical of me to criticize considering it's the same detraction I see a lot of when it comes to The Force Awakens and yet I loved every damn second of that film. 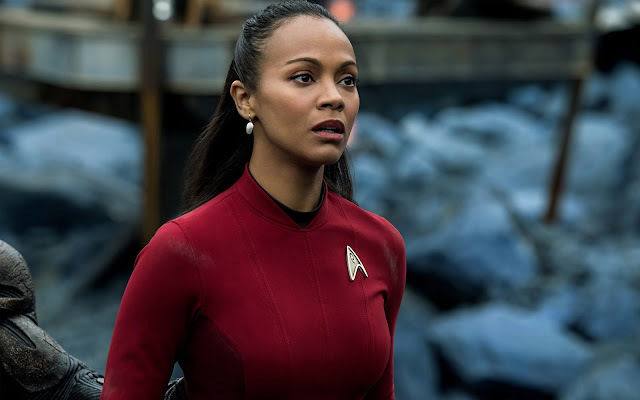 The point is, I am judging these modern takes on the Trek universe with a different perspective than many, as even today as I am writing about Star Trek Beyond I am still yet to see anything prior to 2009. I was told to check out Wrath of Khan. I think I will. Until then, this is the way I see these three films, like it or not, because my mind cannot pretend to be upset about something it does not know. Maybe someday I will see what many see and understand where the vitriol and furthermore the celebratory attitude towards a change in director comes from, as Justin Lin took over for Abrams for the third film. This current trilogy is my Star Trek, and as such, consider me a fan. As for the new installment, I will admit that I had some pretty huge concerns after seeing the first trailer however many months ago. After Star Trek Into Darkness left many dissatisfied thanks to its mimicry of past material, I couldn't help but think that what I was seeing now was a clear attempt to replicate the success of Guardians of the Galaxy, a film that managed to (somehow) seamlessly weave deep space, science fiction oddness with real world music and references, and James Gunn pulled it off in what is still my favorite Marvel film to date. The thing is, the reason it worked is because it was so refreshingly unique, so when someone says "What's the next Guardians of the Galaxy?" the answer is, it's impossible, unless of course we are taking the question literally and then it would be Guardians of the Galaxy Vol. 2. No other director can capture that same lightning in a bottle because it was already caught and released onto the world, and trying to duplicate that feeling in an audience will unquestionably end up falling short. 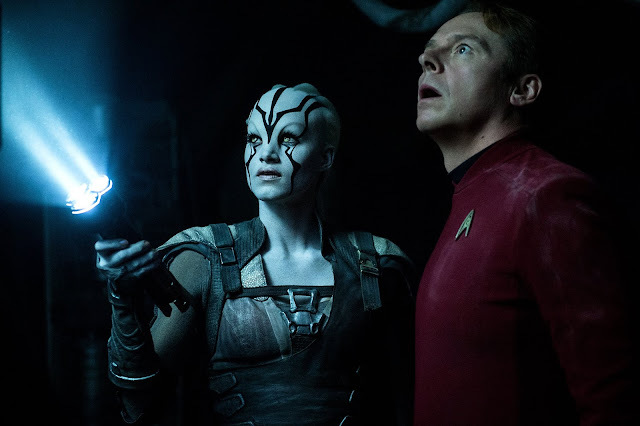 The good news is, while Star Trek Beyond did venture into a bit of Guardians type territory by incorporating seemingly out of place musical cues as mechanisms for both humor and action, for the most part it manages to be entirely its own thing, an adventure to deep space that maintains the same extremely impressive ensemble from the Abrams films while taking on a bit of a different tone. The adventure aspect of this film is something that completely worked for me as even as a defender of the two previous films, Abrams chose to make the stories more grounded and gritty at the expense of exploration and imagination. I mentioned the impressive ensemble and yes, the usual suspects all continue to showcase terrific performances and the always building and maturing chemistry between the characters. It broke my heart to watch Anton Yelchin on the screen knowing that if this series lives on, he will not be a part of it which is such a shame. 2016 was the year that my admiration for him as an actor broke out after watching his outstanding turn in Green Room, and he is giving a meaty amount of screen time here with Star Trek Beyond as well and does not disappoint. Anton, you will be missed. Chris Pine, Zachary Quinto, Zoe Saldana, Karl Urban, John Cho, and Simon Pegg (who also wrote the film) are all on point and have been a major reason for my admiration for all three of these films. As for the new faces to the screen, Sofia Boutella (likely best known for her role in Kingsman: The Secret Service) is a really enjoyable addition to the mix here as Jaylah, a character that is stumbled upon when the crew is stranded on a remote planet and she serves as the crucial piece to present them an opportunity to have a chance to return home. She forms a really solid bond with Pegg's Scotty, both literally on screen as their communication forms a bridge of trust between her and the rest of the crew and in the sense that something about the two of them, Pegg and Boutella that is, work together really well and the dialogue between them comes off as genuine. If there is an Idris Elba fan club out there, allow me to join it. I love the man, a gifted actor who constantly does outstanding work regardless of the material he is given, which is why I find myself disappointed right now after sitting down for Star Trek Beyond expecting the villain to shine. Elba does quite well with what he is asked to do, which unfortunately is very little and extremely forgettable, and even in the end the motivations of his Krall character proved to be underwhelming. I get it, why he is so angry with the Federation. When they do flesh out the reasons for his obsessive and murderous agenda, it all makes sense, but it is sorted out in a hurry and falls limp, the type of thing that isn't muddled now but will end up seeming that way years later when people try to remember what exactly pushed him over the edge because the writing of this revelation and the way it is elaborated upon didn't resonate strongly with me. I know Eric Bana's Nero from the first film is considered a weak villain, and it's true he didn't bring a ton on screen beyond progressing the story forward, but at least the motivations for his actions were presented clearly, meaningfully and expounded upon with enough emotional power to sell me that while he is by definition a "bad guy", at least I can see where his vengeful desires came from. Krall is a let down of a villain, a side show to the extremely likable main cast of characters and their clever dialogue that often kept a smile plastered across my face. It's actually because of the crew of the Enterprise and the words Pegg, along with co-writer Doug Jung, gave them that has made this film more enjoyable in retrospect than it played originally, as I sit here thinking back to various moments and lines that were extremely well done. Without a doubt I am a fan of Star Trek Beyond and will proudly sit it along side the previous two films, but with a shockingly uninteresting villain played by a profoundly interesting man and just a general lack of a wow factor for me throughout the movie, I find myself a little less on board with the picture as a whole than I hoped to be. It's a fun adventure, and even without ever seeing it I can appreciate those that have compared it to an episode of the original series because it did feel a bit episodic which could explain where I am coming up short. I walked out of the cinema feeling the same way I would have after a fun and exciting episode of a series, but under those circumstances I would be wondering what was coming next week or at most next season. When I walked in I was anticipating an event, a follow up to a film that felt like just that two years earlier, and perhaps my expectations were misguided. This might be a perfect example of where filling in the massive amounts of Trek emptiness from the past would have helped me, as perhaps I could have appreciated the journey on a higher level and had it mean a heck of a lot more if I knew where the inspiration behind it was coming from. Don't let me rain on any parades with the misconception that I disliked Star Trek Beyond, it's a really good movie and I had a blast with it, but something feels missing. Perhaps I will eventually find it and a revisit will be even more rewarding. I liked this film, but it felt a bit odd to me. I've just recently started getting into Star Trek. I've watched a few episodes of the original series here and there, watched the first two Abrams films, and watched the first four original films. This one felt like a mix of the new and old, and because of that I'm not exactly sure how I really feel about Beyond. On one hand the film looked great and had good action with humor, but on the other I felt the set up and first act lagged a bit. On a whole I liked the character interaction a lot. Serving as both comedic and character spotlights, this film was smart in pairing the crew off to create fresh situations. I do think that was the intention Cody, to take the new and blend in a nice dose of the old to hit the nostalgia notes for people. I do think that when I rewatch this movie I will appreciate it more than I did the first time through. As I am such a Trek novice and only know the Abrams films, those were the standard for comparison and the change in tone and storytelling style threw me for a bit of a loop. My friend's mother once made some statement about being a total "Star Wars" virgin. Claimed ignorance of the whole business. He thought a bit and crafted a little quiz for her. Apparently she did surprisingly well with character identification, role, plot points, etc, all from simply existing in modern western society. I bring this anecdote up as I wonder just how much of a "Star Trek" virgin you can be, even by not watching any previous material. It's amazing how much can be picked up by simple osmosis. Anyway...I find all the "Trek" movies pretty much secondary to the TV series. There were certainly limping lame episodes, but next week there would be a soaring falcon of an episode. They all worked to create rich character and worlds. The movies are all spectacle. I recall debating with a friend over one of the TNG movies. "It was just a two hour television episode" he complained. "And how is that a bad thing??" was my retort. Apparently I'm in the minority, because movie after movie is filled with SPECTACLE. Blow up the Enterprise, blow up planets, kill characters, and so on. I enjoyed "Beyond". Felt I got my money's worth, but have no intention of ever watching it again. All I recall is an insane amount of frenetic hyperactivity trying to motocross as fast possible over teeth-jarring plot holes in the road.